Kleiner blauer Gas-Ofen der Firma Tekno. Dänemark. Lovely Tekno oven , tinplate made by Tekno, Denmark.Door opens. Marked on door "Tekno Very nice for the dollhouse Kitchen. Size L.1 2/3"cm x 3/4" high. 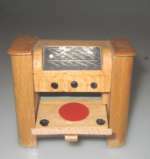 A lovely Danish Dollhouse accessory: Tekno Dollhouse oven for baking (stove) made in Denmark ca 1930.Door to open. Inside one baking plate. H: 3,5 cm L. 5 cm ( 1 1/2" x 2"L.) Good condition. Radio and grammophone wooden dollhouse furniture piece. Radio and grammaphone wooden dollhouse furniture piece. Nostagic. Ca 1940.A great piece for the dollhouse of that time. See all pictures. Tekno saucepan, tinplate, red, 1930. 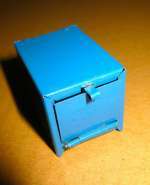 A loveluy item made by the Danish Company Tekno.Fine for a dollhouse.